Michael Laudrup has urged his players to re-focus on finishing the Premier League in style following their Capital One Cup success. The Swans boss has set a target of finishing on 50 points and securing ninth place in the top flight. The club resume their Premier League campaign at home to Newcastle United on Saturday following their 5-0 League Cup win over Bradford City at Wembley. "I still think we could at least arrive [at] 50 points," Laudrup said. "I think we have to do a little better than last season, to do better than 11th. We are ninth - we would like to stay there. "That means 13 points more in 11 games. That should be possible. "I admit we have some very very difficult games out there. We have to compete otherwise we could lose most of them. "We've been competitive the whole season apart from Liverpool and two or three half matches. We can't stop doing that now." The players enjoyed a League Cup victory parade in an open-top bus around Swansea City centre on Tuesday with thousands of fans lining the route. Now Laudrup wants his players to concentrate their efforts for the remaining league matches. A victory over the Magpies would see Laudrup's side reach 40 points, effectively securing Premier League safety. But the Dane demands his side to show their maturity and push on to secure a higher tally than the 46 achieved under Brendan Rodgers last season. "There might be a negative reaction after winning the cup - I hope not - but it's a possibility," he said. "I hope the players go out and play the best game of the season, because this is the first game after the cup final, we are playing at home in front of our fans with the cup on display, so I hope - but I don't know. "The fact we are now in the Europa League next season has nothing to do with our Premier League form, because we didn't start the season thinking about Europe." Since Swansea's Wembley glory there has been increased speculation on former Barcelona player Laudrup's future at the club. 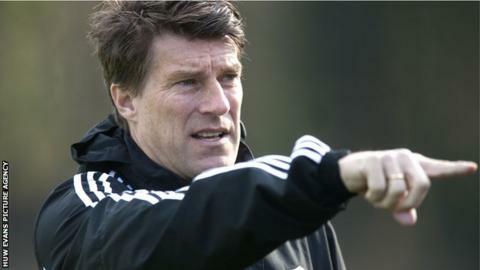 But Laudrup has reiterated his intention to stay at the Liberty Stadium for another season at least. "There is not much to say. I've said it a couple of times, my intention is to stay next season but, again, who knows about the future?" he said. "That is the only way I can answer and the same next week and next month, so I want to leave it there and go back to what is important which is the games. "I've never said I do not want to manage a big team one day, it is just not a dream of mine - that's different. "If I go somewhere one day I do, if I don't, I don't. It has nothing to do with ambitions, I have ambitions - how can I not after playing at big clubs for 17 years and winning titles? "I just don't have a plan for three years' time. It's just how I feel." Laudrup confirmed defender Chico Flores is still a few weeks away from making a return after rupturing ankle ligaments, but left-back Neil Taylor is back in training after six months out with a broken leg.